This is it. After two weeks of travel in both Iowa and Washington, D.C., this is the last of my travel blogs. If you’ve been reading, yay! If not, I don’t blame you, but as I’ve said over and over these last ten years, this blog is essentially a journal for me…so that’s why I write about places not in Southwest Michigan. I was nearing the point in my trip where I needed gas and a Pepsi or two. I don’t mind driving by myself and in some ways, prefer it, but I was starting to get tired and I wasn’t even halfway in to my trip yet. 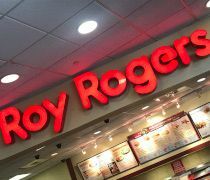 I kept seeing signs for a place called Roy Rogers. This is, obviously, not a chain we have in Michigan despite being founded as a chain of roast beef stores in Ft. Wayne, IN. I didn’t know how far west they go. I knew if I was going to check this place out, I would have to do it soon. Roy Rogers is a chain mostly in the Mid-Atlantic and Northeastern United States. They have a very convoluted history being bought and sold over the last several decades including being owned by Hardee’s at one point (I’ll come back to this in a few). 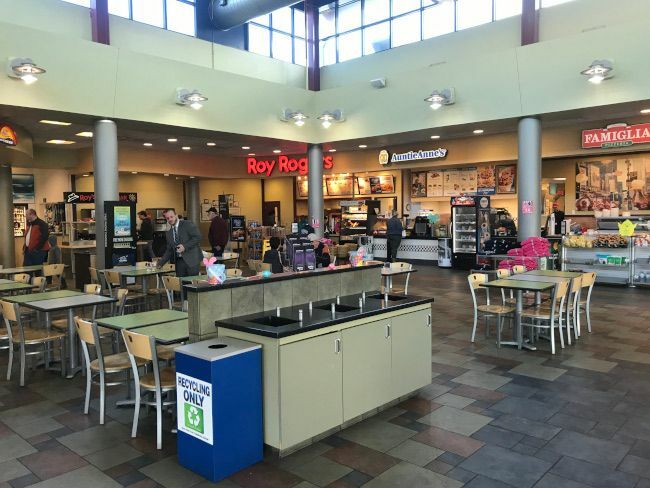 The Roy Rogers location I stopped at is actually run by HMS Host…the same people that do almost all of the airport food franchises. 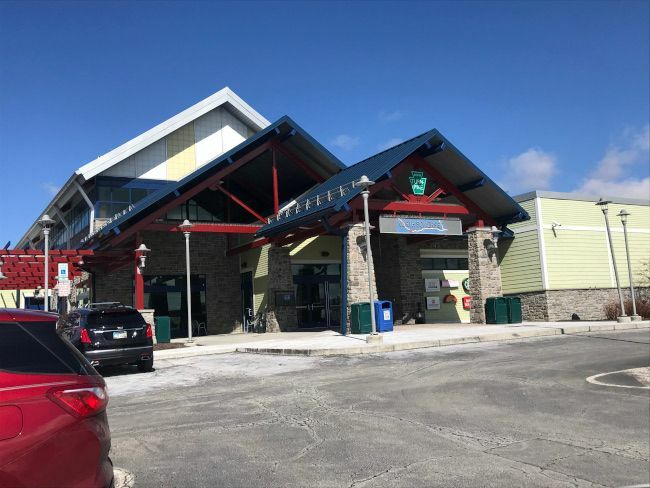 It’s in the north travel plaza on the Pennsylvania Turnpike just southeast of the city of Somerville, PA. The travel plaza is set up like a mall food court. In addition to the Roy Rogers, there’s also an Auntie Anne’s, a Famous Famiglia, and a convenience store selling pop, chips, and all those other snacks. There’s also a large dining area shared between all of the retailers in the plaza. The Roy Rogers is in the back corner. It’s set up like any other fast food food restaurant with the counter up front, a rack of warmed chutes behind it and the kitchen behind that. The menu hangs above the counter and has a lot of the familiar fast food items including burgers, roast beef, and fried chicken. I ordered a roast beef sandwich and a “holster” of fries. I passed on the drink because they had Coke products and I was planning on grabbing a couple of Pepsi’s from the convienence side of the store before getting back on the road. The cost was just a little over $11. It didn’t take long at all for my number to be called and for me to be back on my way. I started with the roast beef sandwich in the car because I didn’t want to try and eat that while driving. 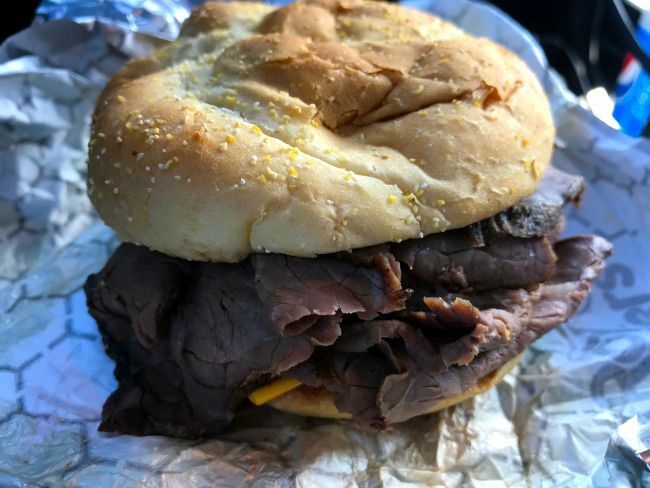 The sandwich is pretty typical fast food sandwich with a soft white bread bun sesame seed bun and a mound of sliced roast beef on top of a slice of cheese. The roast beef is cut pretty thick..much thicker than it’s big competitor in the roast beef department. That was a little hard to get used to at first but not a big deterrent. The fries were….well, fast food fries. The “holster” wasn’t nearly as big as I thought it would be. It was filled with typical fast food fries. Nothing fancy but a compliment to the sandwich. I mentioned earlier Roy Rogers was owned by Hardees at one point and the significance of that is Roy Rogers reminds me of the late 80’s, early 90’s era blue and orange Hardees. They server burgers, they serve roast beef, they serve fried chicken…all things Hardees used to do before being bought out by Carl’s, Jr. I remember getting roast beef from Hardees all the time growing up as well as stopping for fried chicken occasionally. We almost never got burgers when we stopped there and that’s kind of what Roy Rogers really reminds me of. 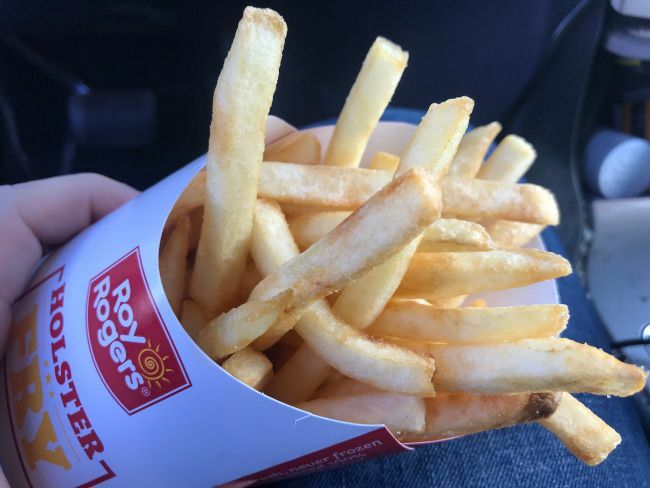 Roy Rogers is just another fast food place. It’s not one of the new, hip places that you have to stop if you find it. It’s right alongside the Burger Kings and Hardees of the world. It’s a nice change from the norm when you do see one but it’s not something I’m going to be petitioning to bring to Michigan. We finally got to try Roy Rogers when we went to DC a couple years ago. We hit one in northern Maryland (Frederick, MD, I believe) though on the way back, one not in a travel plaza. 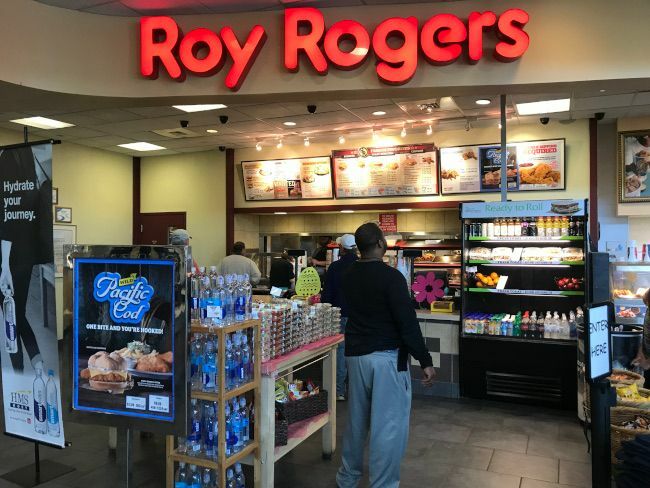 I say that because by hitting the one you did, you missed what we felt was the single defining thing about Roy Rogers: their actual normal restaurant locations feature a “Fixins Bar” full of toppings, and it’s not a tiny one. You can top your sandwiches with whatever you want, as much of it as you want, and they have a fair number of choices to choose from including pickles, jalapenos, onions, salsa IIRC, etc. I forget what all there was, but the toppings and sauces were a decent selection The kids really dug that. It’s a small thing, but it’s one that left an impression on everyone and the one thing they really remember about it (“Oh yeah that was the place with the toppings bar!”). Otherwise their food was just fine. Not great, also not bad. My roast beef sliders were pretty good, and like you I was taken aback at first by the thicker cut beef compared to Arby’s. Nobody regretted it at all though. I personally was excited though because for years growing up I’d watch NHL hockey telecasts from the east coast on the old big satellite dish (where you’d often have to watch the local telecast for the OTHER team your team was playing against because it was the only place the game was on) and they’d always advertise things like Roy Rogers, and I never thought I’d get a chance to go to one. So that was cool. Now that you say that, I saw the toppings bar there and didn’t realize what it was.